My name is Bob Frassinetti. And I sell art and all kinds of antiques from Buenos Aires, Argentina as well as Chile, Paraguay or Uruguay. 2 photos | 8 views | Add a comment? items are from 30 Aug 2010. Meantime, ...............Read daily Up Dates on Art and Antiques for Buenos Aires, Argentina http://www.frassinetti.bizArgentina also exports antiques over 100 years old with the help of Bob Frassinetti Read all about the South of South America, Argentina, Chile and Uruguay on this link. 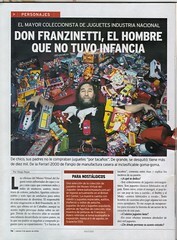 Updated and new web site, The Buenos Aires Toy Museum, Argentina www.the-ba-toymuseum.com Chat some more soon, ................................ Bob Frassinetti.